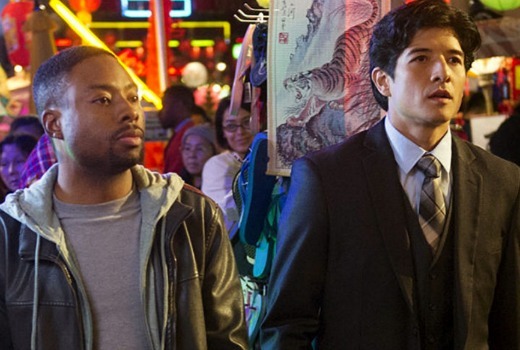 New US action drama Rush Hour begins on Seven next month. Based on the feature film of the same name, it stars Justin Hires and John Foo as US and Hong Kong detectives, respectively. Filmed by Warner Bros in Los Angeles (in conjunction with James Packer’s RatPac Entertainment), it premiered on CBS in March but has since been cancelled. Seven should still have all 13 eps to screen. In the series premiere of Rush Hour, cultures clash and tempers flare when a stoic, by-the-book Hong Kong police detective is paired with a maverick LAPD detective to investigate the theft of Chinese artifacts in Los Angeles. A reimagining of the hit feature film franchise, Rush Hour is an action comedy about a maverick LAPD detective and a by-the-book detective from Hong Kong who knock heads when they are forced to partner together. Detective Lee (series star Jon Foo) is reserved, honorable and a master at martial arts who comes to Los Angeles to avenge the alleged death of his sister, Kim (recurring guest star Jessika Van), and learn more about her connection to a Chinese organized crime ring. Detective Carter (series star Justin Hires), on the other hand, is a wise-cracking cop who plays by his own rules. Yet as exasperated as he makes his boss, Captain Lindsay Cole (series star Wendie Malick), she knows Carter is a brilliant detective who gets results. Attempting to help the two get along is Sergeant Didi Diaz (series star Aimee Garcia), Carter’s friend and former partner who doesn’t hesitate to call him out on his antics. Secretly aiding them as an informant is Carter’s cousin, Gerald (series star Page Kennedy), who is a low-level offender who runs with a tough crowd. Even as cultures clash and tempers flare, Carter and Lee can’t deny they make a formidable team, and grudgingly admit that sometimes an unlikely pairing makes for a great partnership. 8:30pm Thursday June 9 on Seven. Strange timeslot considering mid june is when they have life afl on thursday nights in some states for a 4 week period. surprising timeslot since its axed, won’t last long there anyway. perhaps the same slot on 7flix or 7mate would be better. They should have saved time and put it at 10:30 or 11:30pm. Or he’s a novel idea instead of putting stupid repeats of bogan shows on Monday night on 7mate put it there instead! Exactly what they should be using the timeslot for. I’d say that 7 would be happy with 400k viewers for 2-3 weeks. Funny that 7 would put a failed, already cancelled series in a primetime slot on the main channel-illustrates how little they care about Thursday nights now I suppose. Its being burnt off in doubles, not like there’s much competition really these days. Ten have L&O SVU if they can be bothered showing it, ABC has Rake (which is easily the best of the lot IMO), and its cooking night on SBS. It’ll come 3rd out of those, I assume 7 are happy with that given how much live NRL is costing 9.